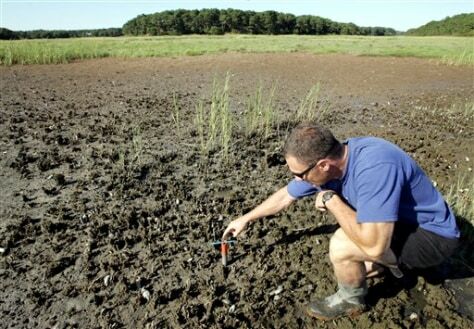 New England marshes dying, but why? Plant ecologist Stephen Smith, who works on Cape Cod for the National Park Service, examines a measuring rod in a dying saltwater marsh in Wellfleet, Mass. Scientists began noticing dead patches from Maine to Connecticut four years ago. The rod, which is hollow and provides samples of silt, is also used to measure the rate of decay in the marsh.